Forensic toxicologist Amanda Thompson shares a behind-the-scenes look at forensic work. The Hollywood interpretation of forensics is played out on TV shows like CSI Miami where detectives, like Horatio Caine, stride around crime scenes in suits and sunglasses spitting out fast one liners and the labs are filled with more technology than Star Wars. In the real world, forensic work involves real people and real stories of life and death, and is a far cry from the examples set by TV shows, as Amanda Thompson explains. 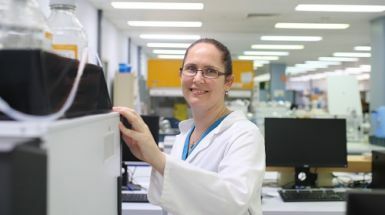 I’m a senior chemist with the Forensic Toxicology department at Queensland Health’s Forensic and Scientific Services (FSS). Primarily, my job is about the detection of drugs and alcohol in biological specimens—blood, urine, saliva, hair, liver—as well as other samples from post-mortems. Most of our samples come from the Queensland Police Service and the Coroner’s office. For the police, there may be saliva samples collected during roadside drug testing, or blood samples from people suspected of driving under the influence of drugs. Other samples come from autopsies around the state and we’ll examine the samples to see if drugs were involved in a death. Or in some cases, we might be looking to see if a drug is absent. For example, if a deceased person was meant to be taking anti-depressants, the absence of the drug can be an important finding. We work closely with other teams at FSS like Forensic Pathology and Forensic Chemistry to make sure we’re across the changes in drugs people are taking, so we know what we’re testing for. Some of the so-called ‘legal highs’ have become more popular in recent years, and while they may not be detected in standard workplace drug tests, we have a range of cutting-edge techniques that will pick up most things. When shows like CSI and NCIS were at their peak, there was an increased interest in this field and it became a more competitive field to get into. Some hearty competition is always welcome in a field like forensics because it helps bring some of the best and brightest minds into science. However, those shows don’t accurately reflect what we do as our work is very detailed and takes more time than people may realise. For example, if we are testing for drugs, we first have to extract the drugs out of whatever specimen we’ve received. If it’s a blood sample, it can take a few hours to separate the drugs from the blood and the other stuff mixed in there. From there, it’s run overnight on a machine to analyse before we can produce the results. Most people working in forensics specialise in one area—toxicology, or DNA for example—we’re generally not multi-disciplinarians. For anyone worried about monotony setting in, please don’t. There is always something interesting to discover. Although this is an extremely rewarding job, it can also be a challenging job. But I remind myself I’m doing something to help a person, and their family and friends. My work may be able to provide answers which contribute to determining the cause of death or help provide evidence to support police investigations. Knowing that there is always someone somewhere looking for answers and the results we’re producing helps provide those answers is a rewarding feeling. 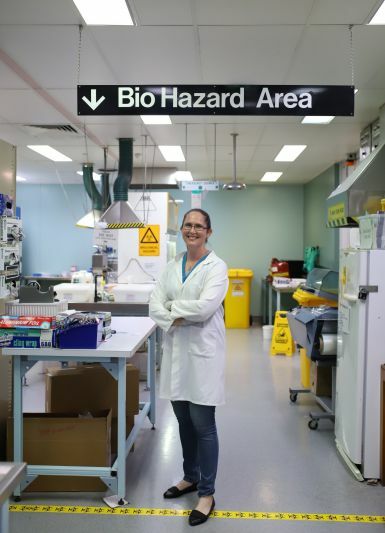 Forensic and Scientific Services provides expert forensic analysis, scientific testing and advice to maintain and improve our public and environmental health—helping care for Queenslanders.